What happens when Two Chimps meet a Red lion? They get on swimmingly, of course. No tail pulling here. Read on to find out more about Two Chimps Coffee at The Red Lion in Gilmorton. The village of Gilmorton is tucked neatly in the south of Leicestershire, not far from Lutterworth. On its bustling main street, you will find The Red Lion, a true village pub with a traditional setting and a real ‘village pub’ feel. This village pub has a warm open fire and candlelit tables too. With a great garden space for the summer months and a bouncy castle every Sunday, there is something for all. There is ample parking and you can take your dog also. In addition, according to Trip Advisor, dogs are made welcome with fuss and sausages – it’s a dog’s life. They offer set menus for important days like Mother’s Day or private events, alongside their ever-changing a la carte menu. Themed food evenings include a Spanish Tapas Tuesday, Steak and Wine Wednesday and Fresh Fish Friday – amazing. Alongside a large range of beers, ciders and wines we are proud to say that you will now find Two Chimps Coffee. At events and functions, a freshly brewed pot of filter coffee is on hand. For the end of your evening meal, an espresso-based drink made to order is just the ticket. Our coffees are roasted in small batches from our roastery in Rutland and delivered to The Red Lion weekly. When we deliver, we check that the coffee is pouring and tasting as it should and do any onsite training with new or existing members of staff if needed. At the moment the Two Chimps coffee at The Red Lion at Gilmorton is either one of two single origin, ethically sourced coffees. First up is a Mexican, juicy and sweet coffee through a filter. Second, is an El Salvador, smooth and biscuit-sweet coffee, served from an espresso machine. Finally, grab a Two Chimps Coffee at The Red Lion today! Over and Out. 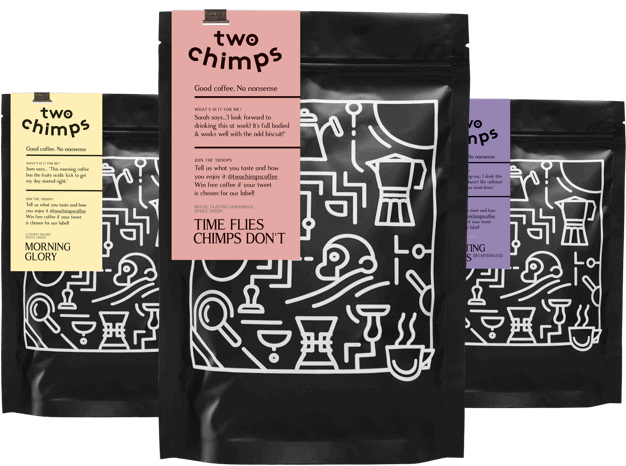 Where else can you try Two Chimps Coffee?